Originally published on: Nicola Ricciardi et al, Patrick Tuttofuoco. Portraits. 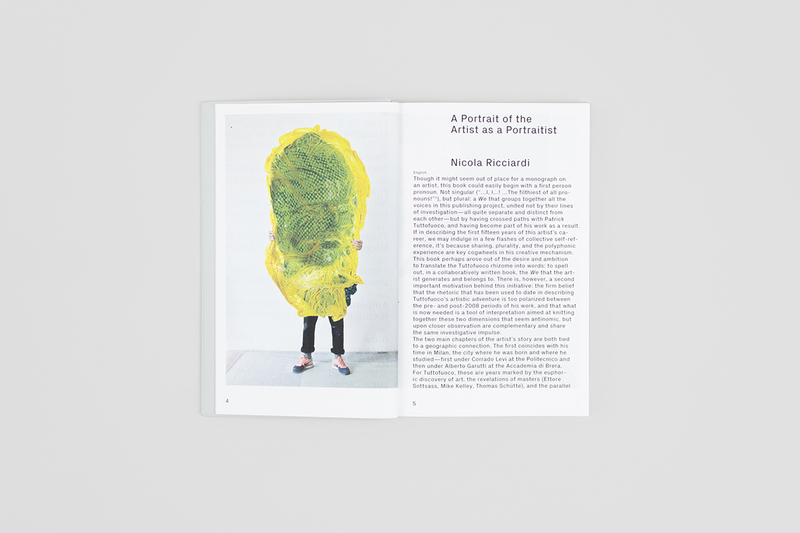 Portraits, Portraits (Milan: Mousse Publishing, 2015), 5–27. Though it might seem out of place for a monograph on an artist, this book could easily begin with a first person pronoun. Not singular (“…I, I…! …The filthiest of all pronouns!”), but plural: a We that groups together all the voices in this publishing project, united not by not their lines of investigation—all quite separate and distinct from each other—but by having crossed paths with Patrick Tuttofuoco, and having become part of his work as a result. If in describing the first fifteen years of this artist’s career, we may indulge in a few flashes of collective self-reference, it’s because sharing, plurality, and the polyphonic experience are key cogwheels in his creative mechanism. This book perhaps arose out of the desire and ambition to translate the Tuttofuoco rhizome into words: to spell out, in a collaboratively written book, the We that the artist generates and belongs to. There is, however, a second important motivation behind this initiative: the firm belief that the rhetoric that has been used to date in describing Tuttofuoco’s artistic adventure is too polarized between the pre- and post-2008 periods of his work, and that what is now needed is a tool of interpretation aimed at knitting together these two dimensions that seem antinomic, but upon closer observation are complementary and share the same investigative impulse. The two main chapters of the artist’s story are both tied to a geographic connection. The first coincides with his time in Milan, the city where he was born and where he studied—first under Corrado Levi at the Politecnico and then under Alberto Garutti at the Accademia di Brera. For Tuttofuoco, these are years marked by the euphoric discovery of art, the revelations of masters (Ettore Sottsass, Mike Kelley, Thomas Schutte), and the parallel liberation—not just his own, but that of an entire generation—from the burdensome legacy of Arte Povera and the Transavanguardia. These are years marked by a highly participatory approach to the artwork, with an aesthetic that drew on American neo-Pop currents and on radical architecture in Italy and the rest of Europe. But for Tuttofuoco these are above all years of speed, embodied by works like Otto (2000), Velodream (2001), Bycircle (2004), Revolving Landscape (2006). It is no coincidence that the element that almost systematically accompanies the artist on this horizontal and vertical race is light; the material he relies on most is neon, now free of the semantic chains of Arte Povera and brought back to the plane of playfulness . All this resplendence, along with his keen attention to the formal aspects of the work, swiftly make Tuttofuoco the harbinger of a new accessibility in contemporary art, perfectly in step with the times. The words that come up most often in reviews of his exhibitions from that era are “immersive”, “relational”, “interactive”: a guarantee that viewers won’t run the risk of dozing off. An incisive synthesis of this view can be found in the enthusiastic public reaction to Luna Park (2005). Saved from the sweeping demolition of the Porta Nuova district of Milan, and relocated to the booming context of Via Ventura, the sign from the Varesine amusement park looks like highlighter on the decorous face of gentrification: the gleaming spaceship of art touching down in the neighborhood with promises of redemption (“All we had to do was wait for dawn, patient and resigned”). Yet if one puts the work into a broader time frame, alongside the glimmer of neon there seems to be a darker, more melancholy luminescence, which cannot be linked only to Tuttofuoco’s nostalgia for the world of memories evoked by that fragment of an irrecoverable Milan, but to a lucid awareness of the fragile, indeterminate nature of the urban fabric. Those words, the memento of an adolescent happiness that seeks a new home (but runs up against the inevitable loss of innocence) takes on the status of a prophetic memento mori (in part ignored, as one can see from the economic problems that plagued Via Ventura after the recession of 2007/2008). Applying the same yardstick to other works of that period, one notes that deep down, all of Tuttofuoco’s work is haunted by a spectral melancholy that is not immediately visible, that the artist keeps concealed. One need only to think of the doomed positivism of Criceto (Hamster, 1999). Most of the literature from those years of speed seems to focus however on the glitter of this merry-go-round, loudly underscored by the casual viewer, who sees Tuttofuoco as the embodiment of a euphoric new global outlook that promises wonders. But when 2007 rolls around, with the great recession, the merry-go-round comes to a brusque halt. Tuttofuoco tries to tell us that he never really put viewers on that painted pony just for kicks, but rather to show that round and round, you always come back to where you started (as in Criceto, for instance). But as the contemporary art bubble is on the verge of bursting, his race seems too unbridled, too perfect not to become an apologia of the pedal-to-the-metal mindset that so speedily led to disaster. This is where the second chapter in Tuttofuoco’s story begins, with his move to Berlin, in 2008. The scale and language of his work seem to mutate, as do the opinions on his work. His pieces become darker and more cryptic, even vaguely threatening. His imagery swarms with ghosts and giants: anthropomorphic distillations of growing concerns. The face predominates as the central element, often rendered as something vague, evolving, in search of a fleeting stability. Tuttofuoco shifts his attention from the gaudy vivacity of neon to the introspection of the mask; his exhibitions seem to confirm that the party is over (as Luca Cerizza aptly notes). To stick with the metaphor of the amusement park, it seems like the artist is inviting the viewer to hop off the merry-go-round only to be led into a hall of funhouse mirrors: the faces that inhabit the exhibitions “First Person Plural” (2009), “Mirrors and Windows” (2009), or “Three Wise Monkeys” (2010) are bewildering, discordant, spectral at times. This new aesthetic, less aestheticizing and more Teutonic, is to some degree experienced and described as an essential abandonment of the viewer: it is telling, in this sense, that even in 2015, at the inauguration of …Mom, Dad, Tuttofuoco’s installation in Milan’s Piazzetta Brera, an anonymous visitor turned—unwittingly—to the artist himself to complain about the lack of electric lighting. Critics seemed equally divided, to some degree disoriented. While previously, the curatorial consensus had been near unanimous, as one could also see from his participation in major international events, in the second half of Tuttofuoco’s career to date, opinions have become polarized between those who see a significant and positive evolution in his work, and those who think the artist is going backwards. Albeit with notable exceptions, some by the contributors to this publication, a dialectic has been established that contrasts the Tuttofuoco of neon with the Tuttofuoco of masks. It is hard to be satisfied with this antinomic approach. The book you are holding is a modest attempt to weave the two passages together into a single fabric, to delve into Tuttofuoco’s artistic language and bring to light a shared lexicon. This exploration began at the end of 2013, but decisively stepped up its pace between April 9 and May 22, 2015, when a series of events provided a possible guiding thread in the guise of three epiphanies (deriving from three artworks). The first of these phantom visitors took the form of Canova’s Napoleon Bonaparte as Mars the Peacemaker, a bronze copy of which stands at the center of the Accademia di Brera’s main courtyard (right in front of the classroom where Tuttofuoco studied). I passed by it repeatedly in the period when I was working with Tuttofuoco on the installation of ….Mom, Dad in the adjacent Piazzetta Brera. The latter is itself an homage to two iconic works of classical statuary: a bust of Nefertiti and a bust of Alexander the Great. In …Mom, Dad, their faces are gigantically enlarged, stretched out over curved steel surfaces, in tinted halftone. Due to this distortion of form and color, the copy, while faithful, becomes allegorical: it doesn’t portray the deeds of the two protagonists, but rather an idea of family, seen through the eyes of an inner child. The Brera’s Napoleon is also a sculpture of a sculpture—a bronze copy, cast by the Righetti brothers at least five years after Canova’s marble original. And it is also a distortion: the Emperor of France himself, when he saw it, thought it deviated too much from its model. Its sturdy athleticism, its muscularity, had no real-world equivalent; Napoleon seemed smoothed, elongated, to achieve the allegorical style to which Canova aspired. Thinking back to how the faces of Nefertiti and Alexander the Great were similarly faithful and yet unrepresentative, I caught myself wondering whether Tuttofuoco, despite his penchant for embodying his own era, isn’t more indebted to Canova than to Jason Rhoades. In other words, whether his art is primarily classical and classicizing. The second epiphany came to me a few days but many kilometers later, when my wife Elisa and I visited the Baglioni chapel, in the church of Santa Maria Maggiore in Spello, on our way to Perugia. Pinturicchio’s famous fresco cycle is embellished with a small and in some ways pioneering element. In a scene of the Annunciation, on a wall of Mary’s meticulously detailed room, is a framed picture of Pinturicchio himself, over a bejeweled plaque engraved with the words “Berrnardinvs pictoricius pervsinvs”. The apparition and treatment of this self-portrait in the form of domestic decor called to mind one of the images by Tuttofuoco that means the most to me: a photo taken while producing the show “Ambaradan” at Studio Guenzani, Milan in 2014 (which later became an independent work, Mr Potato). In this image, we see one of the sculptures in the exhibition, flipped over and held by someone only visible as a pair of hands and legs, below the knee. Yet the hot pink Nikes on his feet sum up Tuttofuoco’s presence in a strikingly clear, emblematic way: they’re a sly fui hic, the postmodern equivalent of Pinturicchio’s face in that Umbrian fresco. In both cases—though with obvious, necessary distinctions—the artist’s hidden image is a personal seal that definitively claims ownership of his artistic product, making it something no longer alienable, but rather a direct emanation of his subjectivity. The object of the depiction may be an Annunciation, or the face of an omenone, but the subject remains the artist. The third and last epiphany took the form of a work by Alighiero Boetti that I found myself handling that May (due to research by Cristina Baldacci and an exhibition curated by Vincenzo de Bellis): Autoritratto a Rank Xerox 0. This piece, from 1969, consists in 12 photocopies of the artist’s face. Boetti almost always uses technology in ways that were not intended, and the photocopier is no exception: the artist’s aim is not, in this case, to multiply his image, but rather to communicate with the machine itself—even though the latter is not equipped to speak, much less to listen. To overcome this conceptual impasse and establish a hypothetical, surreal attempt at dialogue, Boetti resorts to sign language, and each time photocopies not only his face, but a gesture for one of the letters in the word autoritratto, “self-portrait”. What connects this specific piece to Tuttofuoco’s work at large (aside from the hands, an element that crops up in many recent projects, from Ambaradan to the piece he is working on for HangarBicocca as this goes to press) is the relationship between the expression of the artist’s own subjectivity and the delegation of production to someone else. For Boetti, at least in this case, the outsourcing is entrusted to the machine, which through this forced dialogue generates the artwork for him. For Tuttofuoco, who grew up in an era when the fascination with media and technology already seemed to have run its course, the deputation is reserved for the many intellectual collaborators and artisan associates he surrounds himself with: examples of an active, collegial participation inspired by the spread of open-source dynamics. Looking at Boetti’s 12 photocopies, and thinking of the 12 portraits Tuttofuoco made for the exhibition “DYNASTY” (which opened on May 22 at Dispari&Dispari Project in Reggio Emilia), it seems clear that for the latter, seriality is not a prerogative of the final product, but rather of the production factors. I hope readers will forgive me for taking the poetic license of mingling references as divergent as they are anachronistic, but it was by aligning these three works, like lenses in a telescope, that I first realized an important truth about Tuttofuoco that spans his whole career. The three works mentioned above have much in common with the artist’s oeuvre: the indirectly classical (and perhaps unconsciously classicist) nature, the concealed depiction of the artist’s subjectivity through the figuration of others, the parallel between the multiple identity of the artist and the multiple subjects involved in the work. But they are also, above all, three portraits. Starting from this obvious consideration, I tried to find a similar alignment in the works that Tuttofuoco made between 1999 and 2015, and was surprised to note how his urge towards portraiture became ever clearer. The neon and masks seemed indissolubly linked by Tuttofuoco’s desire to portray someone (primarily himself). While this desire is explicit in works such as Famiglia (1999), Dojo (2000 e 2003), and Giovi (2015), in projects like Velodream (2001) and Bycircle, (2004) the portraiture becomes caricature. But doesn’t the same definition also perhaps apply to Grattacielo (2000)—actually a group photo translated into architecture—or …Mom, Dad (2015)—a family portrait in the form of an urban sculpture? Even Luna Park (2005), in its function as a sign, is an abstraction of the portrait concept; the upside-down scooter in Ambaradan (2014) could be a postmodern equivalent to ThePicture of Dorian Gray. As even the title of this book makes clear, portraits are the leitmotiv that has been chosen to map out the first fifteen years of Patrick Tuttofuoco’s aesthetic adventure: a potential key to interpretation, not intended to be definitive, but which aspires to stimulate and suggest a reading of the artist’s work that has been stripped of dichotomies and circumstantial preconceptions. Each of the contributors responded in their own way to this invitation, yielding the choral polyphony that—as noted at the beginning of this long digression—is fundamentally important to Tuttofuoco himself. In the end, it is up to the reader to decide whether these ideas hover separately between the lines, or come together to form, page by page, the portrait of an unexpected portraitist. Link to publication: click here.